Bring the trend home with these effervescent cocktails. At Lantern’s Keep, tucked in Manhattan’s storied Iroquois Hotel, Head Barkeep Theo Lieberman—who trained under the Manhattan cocktail cognoscenti at Milk & Honey—has designed a cocktail menu that’s classic, yet ahead of the curve. Bubbly cocktails are also simple enough for home bartenders to recreate by using a carbonator (Lieberman uses the iSi Twist ‘n Sparkle, approximately $40). “They’re the best things for home entertaining because you can make batches of them ahead of time and don’t have to spend the whole evening behind the bar,” Lieberman says. Try whipping up his Carbonated Negroni cocktail and a few others for your next soirée. 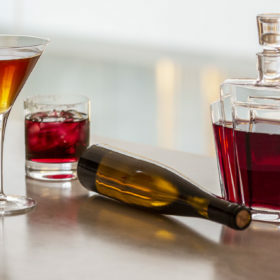 Combine the gin, sweet vermouth and Campari in a cocktail shaker and stir. Strain into the carbonator to carbonate, then pour into a rocks glass and garnish with an orange twist. Combine Tanqueray Ten, St-Germain and white grapefruit juice in the carbonating system. Close the shaker, pressurize and shake vigorously for 6–8 seconds. Let rest for 20 seconds before decanting into Champagne glass. Combine all ingredients in the Twist ‘n Sparkle and carbonate. Wait 1 minute before release. Serve in a coupe glass over ice. Serves 4. What's the Deal with Crazy Garnishes?